Diabetic coma and Scones Galore! It’s obsessive. But also marking a serious step forward in my commitment to baking. Next up: Scones for a Bridal Shower. 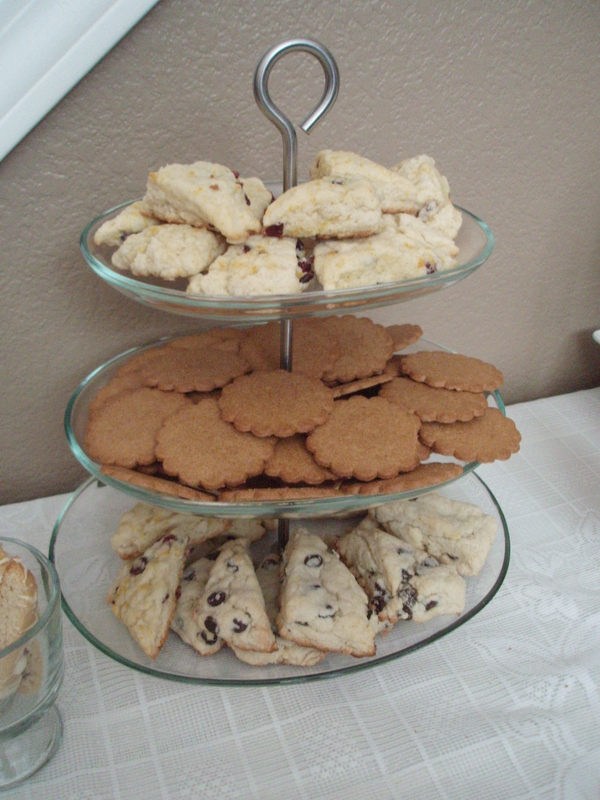 The theme was “tea and tarts..” What better than a variety of scones?! Yum. My first time making scones! They went over pretty well for two recipes that I adapted, so I’ll post those here. 1. Preheat oven to 425 degrees. 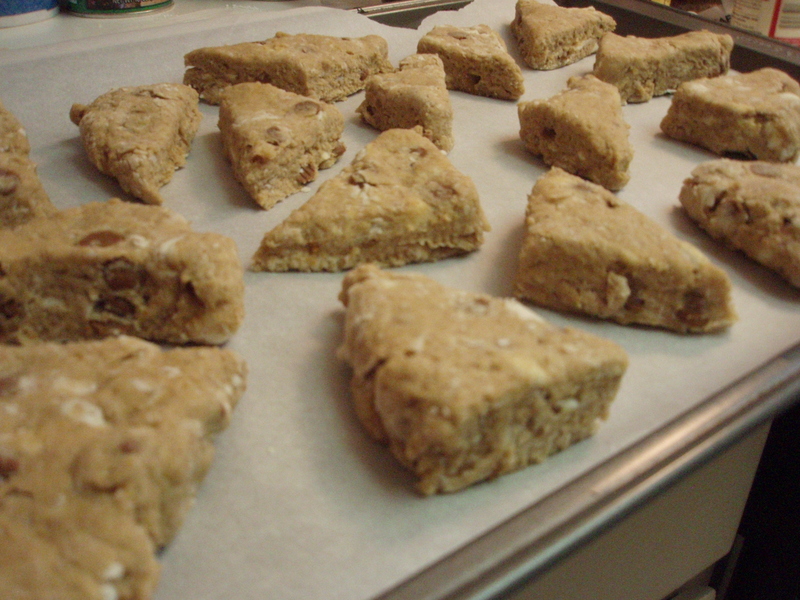 Get out a baking sheet and line with parchment paper. Cut the butter into small pieces, put it in a small bowl and put it back in the fridge. In a medium bowl, combine both flours, baking powder, salt, and spice. Whisk together well. Place bowl in freezer. 2. In another bowl, combine pumpkin, sour cream, brown sugar, and vanilla. Whisk together well. Put this bowl in freezer. Take the other bowl back out. 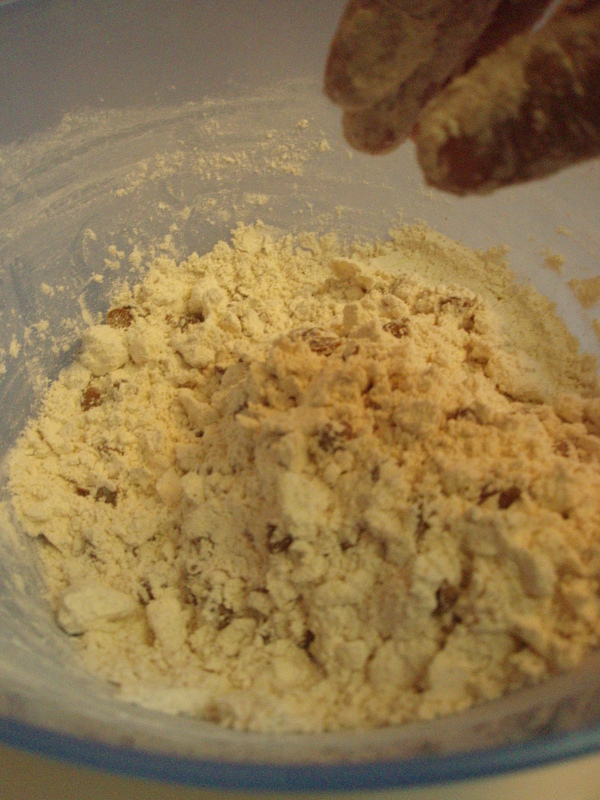 Get the butter pieces out of the fridge and dump them into the bowl with the flour mixture. Cut the butter into the flour using a pastry blender or rub it in with your fingertips until it resembles coarse crumbs. Stir in the cinnamon chips. 3. Get the liquid mixture out of the freezer and pour into the flour mixture all at once. Stir with a spatula until just moistened. Turn the mixture out onto the counter and push the pile together with your hands. Knead it just a couple of times until it comes together, but don’t knead it too much or the dough will get too sticky and you’ll lose the flaky pastry layers. 4. 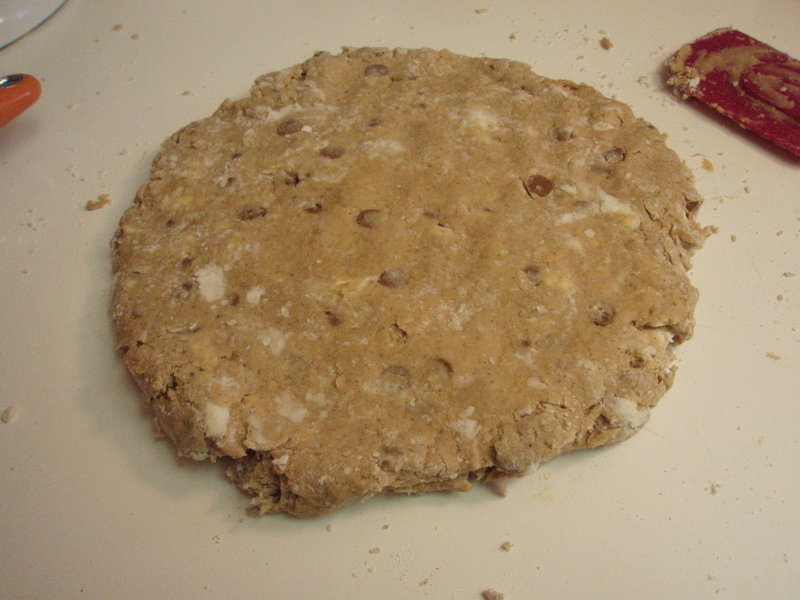 Pat the dough out into a rough rectangle, 3/4 to 1 inch thick. (My picture is a circle because I messed up first)… Cut into 8 rectangular pieces. Cut each of these in half on the diagonal forming two triangle pieces. Place pieces on the baking sheet so that they are not touching. Bake scones for about 9 minutes at 425 degrees. They should be light brown on the bottom; the tops will darken as they cool. Put milk and cream cheese in a small bowl. Microwave for 10-20 sec., or until cream cheese can be whisked with milk into a smooth mixture. Add cinnamon and honey to taste. Spoon into a piping bag or Ziploc bag, cut the tip, and make pretty designs. Or if lazy, drizzle with your whisk or spoon. 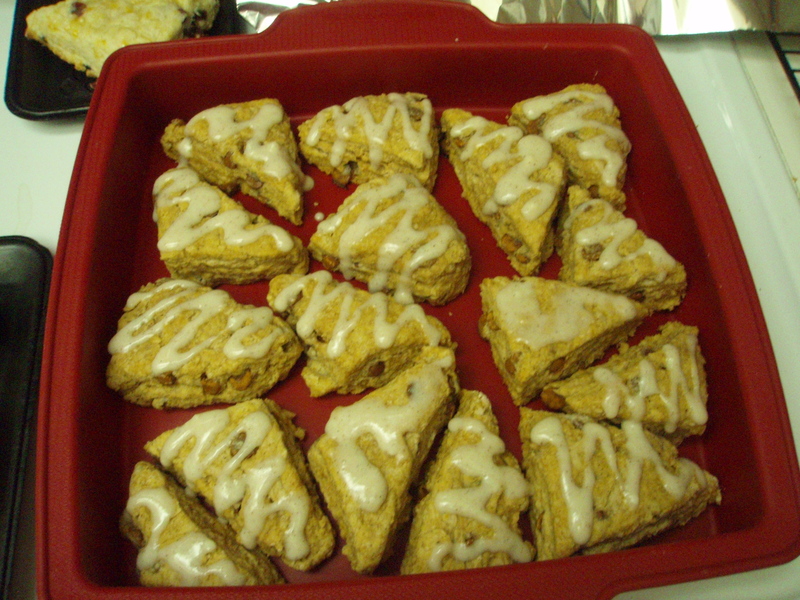 Tasty, flaky, bursting of spice and pumpkin, I love these mini scones. They aren’t too sweet and perfect with tea or coffee. In a small bowl, blend the sour cream and baking soda, and set aside. 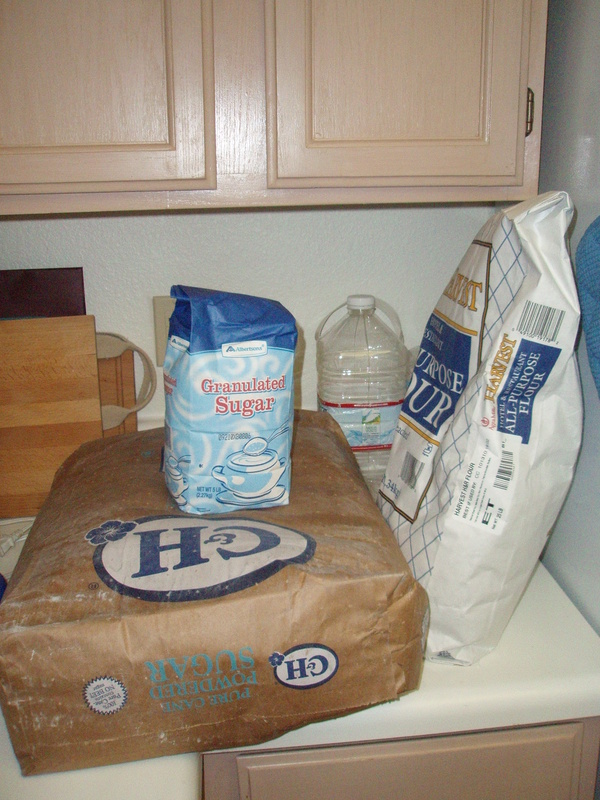 In a large bowl, mix the flour, sugar, baking powder, cream of tartar, and salt. Cut in the butter. (I rubbed it in with my fingers) Stir the sour cream mixture and egg into the flour mixture until just moistened. At this point I divided the dough into two bowls. To one bowl I added half a cup of semi-sweet chocolate chips. To the other bowl I added 1.5 tsp grated orange rind, the juice of half of an orange and ½ cup of craisens. Turn dough out onto a lightly floured surface, and knead briefly. 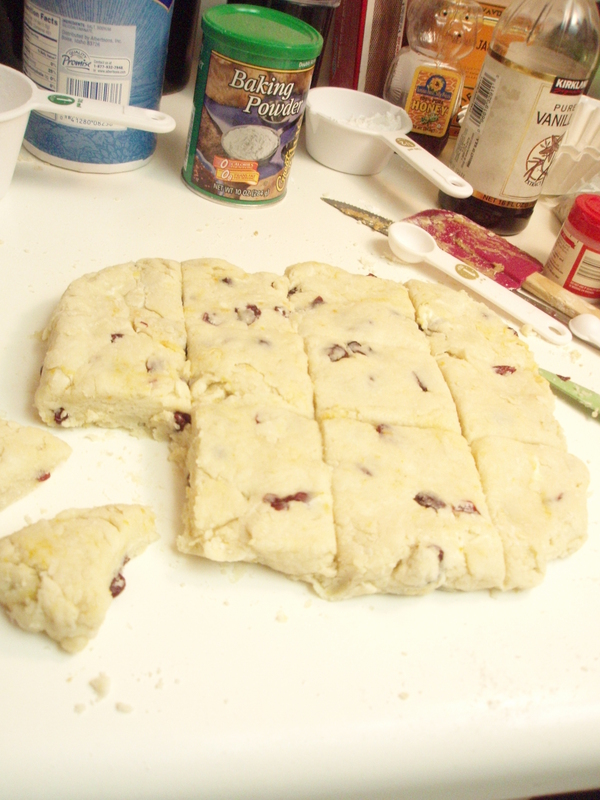 Roll or pat dough into a 3/4 inch thick rectangle. Cut into rectangles/squares (roughly 2 in. x 3 in.) 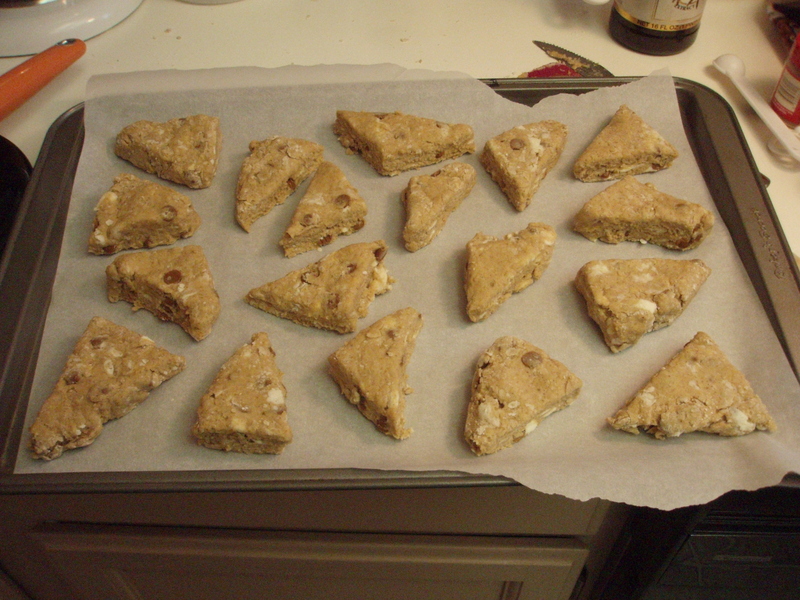 and then cut on the diagonal to make small triangle scones. 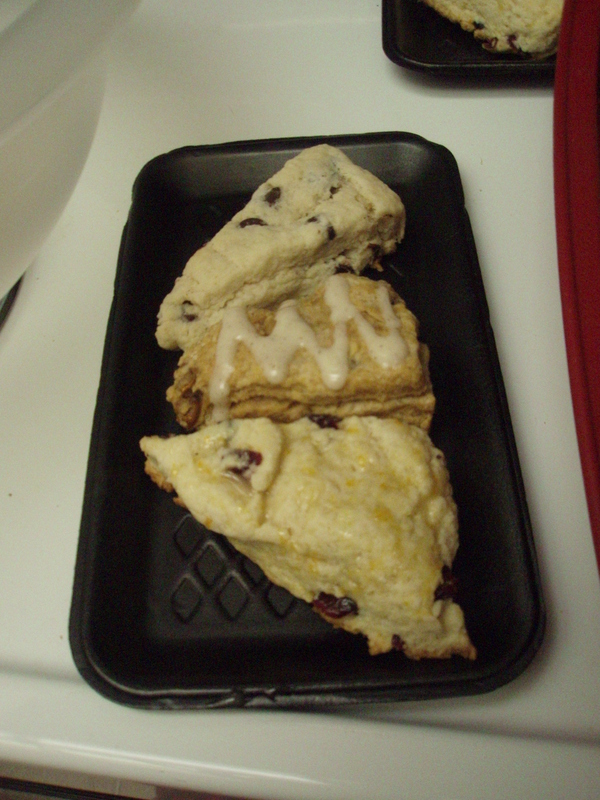 Place 2 in apart on baking sheet. Bake 12 to 15 minutes in the preheated oven, until golden brown on the bottom. I love Fall for the flavors… I guess it’s not Fall anymore, but I’m still in a pumpkin-y mood. A few weeks ago my friend Megs had Fall Fest at work, and since she’s from PA, wanted to do some pumpkin whoopie pies! I jumped at the opportunity to try something new. I used Rachael Ray’s recipe– the faster the better! These little guys were a bit spongy/dense/chewy for me. I’m no expert on whoopie pies but was under the impression that they’d be softer. Oh wells. 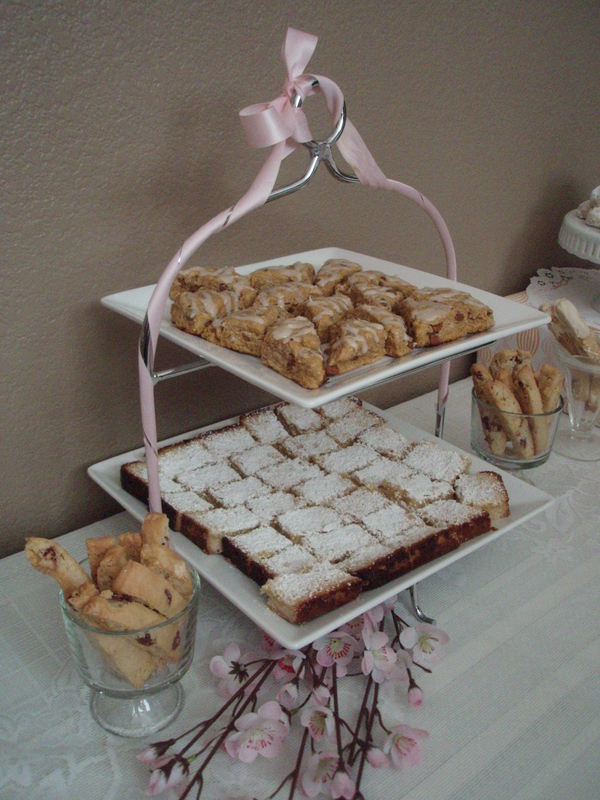 I also re-made them yesterday during the wedding cake frenzy and decreased the amount of flour. Verdict? Still spongy. I’ll get used to it, I guess. The rest of the world has already bought into Rachael Ray, I might as well also. The individual cookies… yummm pumpkin. Piping bags are by far the most useful tool in the world. Even though the recipe says to spread the cream cheese filling, I went with the piping bag. Clean, easy, and makes great swirl patterns! Yum. 🙂 Oh yes, this is one of those random tid-bits (non-wedding-related) that I’m including.